Tai Seng is no longer the old, boring industrial area in Singapore but has slowly become the next #foodie paradise with many new cafes & restaurants sprouting around the vicinity. The prominent food places would be Irving’s Place, BreadTalk HQ and the new mall, 18 Tai Seng. But not many people actually know that there’s more hidden eats further down, in particular the stretch between Tai Seng to Bartley. One of which is the new cafe-bistro, Runway80! Serving reasonably-priced Western-Asian fusion food, you’ll never expect this bistro bar to have such impressive standards. They were really generous with the portion served, and the dishes that I had were AMAZING! 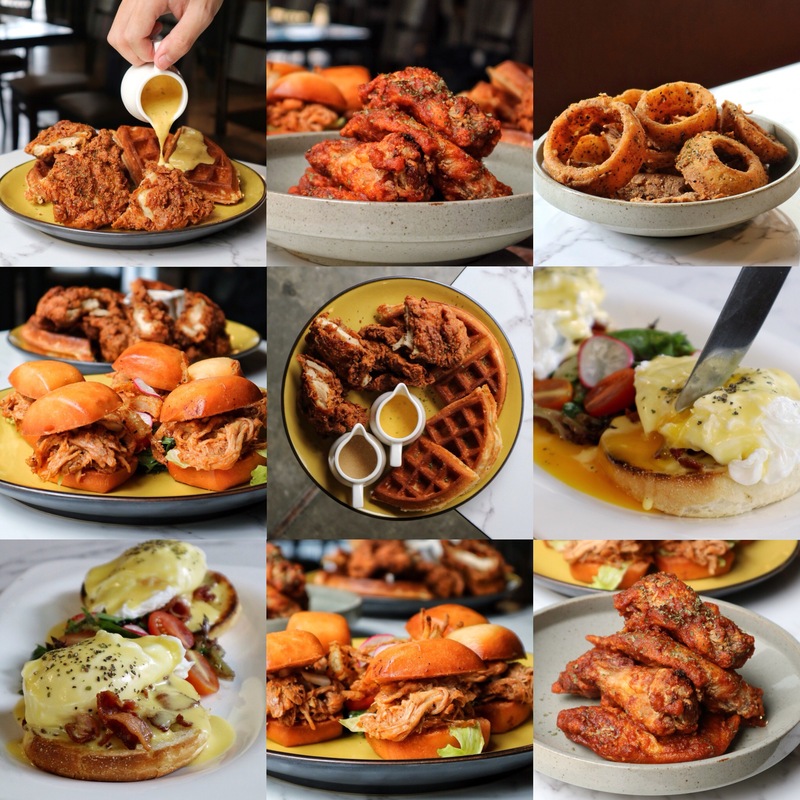 Salted Egg Chicken & Waffles, Pulled Pork Sliders and Salmon Eggs Benedict are some of the MUST-TRY dishes at Runway80! Psst! You can have a drink or two, play darts with your friends/colleagues after work here as well! Aren’t you surprised at the food they served? I was, for sure! Runway80 also offers really aromatic and non-acidic coffee that comes with a nice art! Time to jio all your family and friends here for a satisfying meal without burning your pocket! OMG! Look at how BIG the onion rings were! Super generous of them! Onion rings were well-battered, well-seasoned, crispy and not too oily. Definitely an addictive bar snack! Now, where’s my iced cold beer? Definitely not for the faint-hearted! The buffalo wings were flavoursome but it was HOT, very hot! If you can’t handle spicy well, it’s best to skip this dish! Hmm, the pulled pork sliders were really good. Pulled pork was flavourful, tender and super juicy. Instead of using burger buns, crispy fried mantou was used. Loving the combination but I would have loved it even more if the mantou was less oily. What a sight to wake up to on a weekend morning! Poached eggs were beautiful – flow out like nobody’s business with a gentle slice! English muffin at the bottom was lightly-seasoned and moist. Paired with crispy bacon, this dish is ? Because this is my favourite dish, so it deserves more photos! Let’s start with the Fried Chicken – It was well-marinated, crispy and super addictive! It was so good on its own, I didn’t want to share it! Waffles, on the other hand, were good too! They were crispy on the outside and fluffy on the inside. Paired with the homemade salted egg sauce for maximum pleasure! I’m definitely coming back for this again! A MUST-TRY! Previous PostCreamery Boutique Ice Creams: Halloween Special Lava Cookies & Get A FREE Scoop of Ice Cream for Your Friends when you Cast a Spell!